Tools of the unemployed's hair style power! Then I discovered Living Proof, I had heard of Jennifer Aniston's hair product, but didn't really know it. So after much reading I decided to splurge on one of the Full line's products and marched to Sephora. Initially, due to the horrible guidance by a Sephora girl I tried their thickening mousse. It worked Ok a few times but was not what I wanted. So after I finished it I asked for no guidance and punched the full lifting root spray and finally I had top volume I always yearned for! Given that worked I expanded my reach and tried Living Proof's full thickening cream and thought I nailed it. Blow drying my hair with a round brush for straight hair or taking a curling iron to small pieces of hair to result in tight curls which relax into the ever sought beach waves the next day! 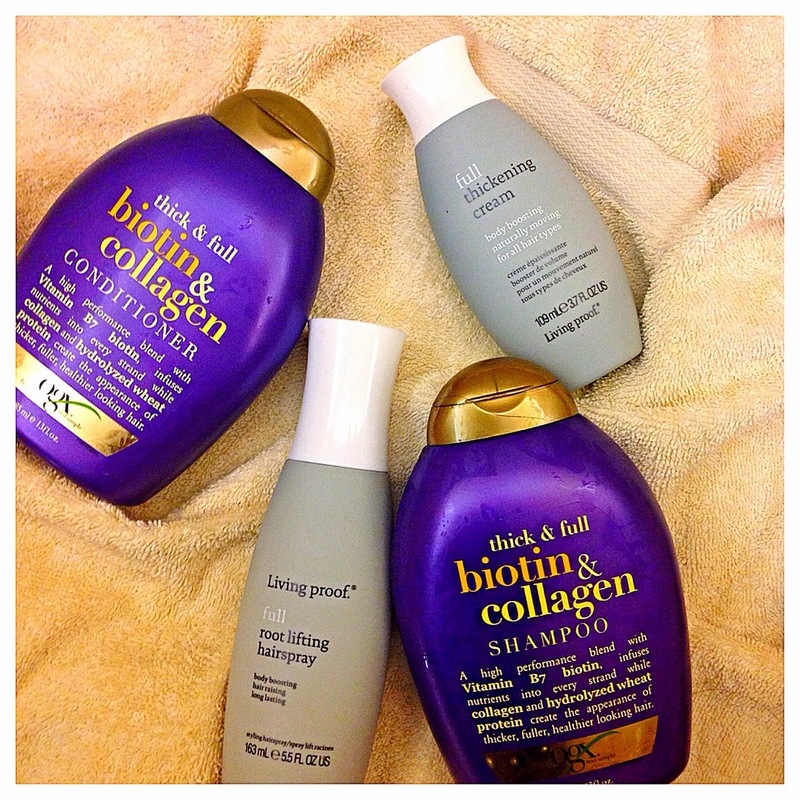 I have also been using OGX Thick & Full Biotin & Collagen shampoo & conditioner (the latter smells insanely good!). The mix of these four products with the occasional Organix morrocan argan oil hair mask I allow to soak in during a steam have been my tools of choice during my balmy weather interview days. My lazy girl routine is simply to wash/condition hair and spray the root lifting products on my roots, massage a small amount of the thickening cream to non-roots areas and comb through. Then I take a blow dryer moving through out hair with occasional finger combs. The result is full of life, full of volume, bouncy hair! (click on links for post gym photos I sneaked in shh). The fact I was just in Miami and this combo proved winning results prompted me to share! I do not guarantee you will want to keep your hair down in the heat but should you put it up after styling it, it will be good to go loose the next day without having to restyle!